Lets talk about running shoes. I’m fed up will blogging about my hurty ribs and inability to run any distance or fast and keep up with my target Janathon mileage. Especially as rather embarrassingly my injury was caused by over stretching over the arm of the sofa to get the TV remote! So… Back in December I got a rather nice email from Mizuno asking if I’d like to try any of their Spring Summer 2013 running shoes. Very exciting, especially to see that Mizuno are adding a minimalist running shoe to their range. Their new Evo was unfortunately out of stock so in the mean time I was offered the Wave Rider 16 to try. I’m so glad I did try this shoe, it might be the one I’ve been looking for for a while. It’s certainly the shoe I’ll run everyday of January in. For the past few years I’ve run in either Saucony Kinvaras or Brooks Green Silence. I have recently had problems with both. The Kinvaras giving me black toe nails but the size up in the new model is on the large side and having too high a heel counter rubs my Achilles. Brooks have discontinued the Green Silence. Also towards the end of my marathon training I had a bit of a shoe tantrum realising that although I normally mid foot strike, on long slow runs, when tired, I heel strike. I was getting tight calves, painful achiles and beginning to pick up general injuries. 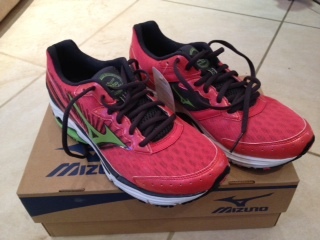 I thought that maybe I should revert to a more traditional cushioned running shoe for long runs and high mileage. I tried a few models. All felt wonderful and comfortable when tried on and walked in and even on short runs having nice wide and spacious toe boxes. However, when running in them they began to either feel like I was running on a mattress, unable to feel the road (hard work) or had a prominent heel so when I did pick up the pace and run on my toes/midfoot the heel appeared to get in the way. I gave up trying and reverted to my Brooks for my marathon and searching the internet for discontinued stock in my size. Then I got the Wave Rider 16s. They are a great fit for me. (But then I’ve found that with Mizuno in the past) a little more substantial than the Kinvaras and Green Silence offering heel cushioning when I need it but with very little extra weight. Light weight is probably the main reason I wear minamalist shoes! What I liked best about the Wave Rider 16s is the responsiveness. There isn’t too much shoe under the midfoot like many cushioned shoes. I can feel the ground and that I’m getting something back for my efforts. I am not aware of the heel when running on my midfoot and they feel better and better the more I run in them. I’m sure they’ll be good for a bit of speed too, such a shame my ribs weren’t up to my 10K race today to put them through their paces. A great shoe. May well become my workhorse, keeping minimalist shoes for trail and short fast runs. Thanks Mizuno. Janathon day 6. 3.27 miles run, the same route as Friday, fortunately over 5 mins faster! Ribs on the mend…. Categories: Janathon, Product review, running | Tags: Janathon, Mizuno Running, Mizuno Wave Rider 16, Running, running shoes | Permalink. There is something so satisfying about bright pink trainers. So pretty! I have a soft spot for Mizuno and only steering away from them for the first time yesterday with an Asics purchase but will continue to wear Mizuno anyway (love my Wave Nirvana 8s). I thought this about Mizuno Wave Riders. They are great shoes, but after a couple of years great running in mine I have decided to jump ship and giving the Brooks Ghost a go at the mo. I’ve got the Wave RIder 15, seems like a great shoe. Glad you are on the mend. How do you get to be so knowledgeable about shoes? I have one pair that I run to death! That said, I’m very glad you like ’em!